All instinct, no plan needed. or the right word, from the right voice. before the next round starts. Nick Bush is an associate professor of English at Motlow State Community College and an amateur stand-up comic in Nashville who writes fiction and poetry when he’s not watching the Titans or cooking low carb meals. He also co-hosts the Let Me Ask You This (LMAYT) Football podcast and co-edits The Mosaic literary magazine. Photographer’s Note: I found this poem both comical and brilliantly written. I designed the paired photo to capture how it made me feel. 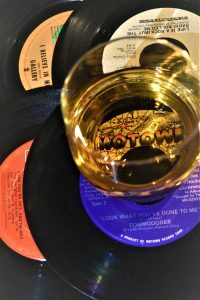 It represents what a little liquid courage and good music can do for a person (note the song title of the 45 the drink is sitting on). I also used a Motown group as a play on the general belief that white men can’t dance.